BEVA has announced the winners of the reciprocal Voorjaarsdagen BEVA Award and the Sam Hignett Award as equine vets Adam Redpath and David Rendle respectively. These winners are selected on merit of their presentations at BEVA Congress, which was held in September. BEVA presents a series of awards at BEVA Congress each year, to some of the profession’s most outstanding contributors to equine veterinary science, health and welfare. The Voorjaarsdagen and BEVA Awards mark the close relationship between the two Associations. The two awards are selected and presented biannually, once at the Voorjaarsdagen Congress and once at BEVA Congress. This year’s reciprocal Voorjaarsdagen Award winner is Adam Redpath, for his paper Aminoglycoside Antibiotics; still essential in equine practice? 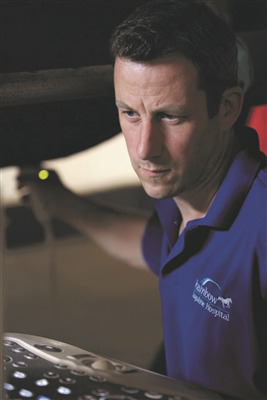 Adam is a Clinical Teaching Associate at The University of Nottingham working at Oakham Veterinary Hospital. He is working towards specialist status in Equine Internal Medicine, also studying towards a PhD in equine analgesia and European Diploma in Equine Internal Medicine. His prize is free registration to Voorjaarsdagen Congress 2019 where he will have the opportunity to present his paper again. The Sam Hignett Award is given for the best clinical research presentation from general equine practice. This year’s winner is David Rendle, for his paper Efficacy of a novel palatable pergolide paste formulation for the treatment of pituitary pars intermedia dysfunction (PPID) in ponies. David is a specialist in equine medicine at Rainbow Equine Hospital and was selected for the Award from those presenting Clinical Research papers at BEVA Congress 2018. As a winner he will receive free registration to next year’s AAEP Annual Convention. • The BEVA Equine Welfare Award sponsored by Blue Cross: Dr Peter Rossdale OBE FRCVS. • The BEVA Award: Inge J.M. Slenter. • The EVJ Literary Award for Video Abstracts, sponsored by IMV Imaging: Dr Thomas van Bergen.